Winchester City Hall is located at 15 North Cameron Street, Winchester, VA 22601; phone: 540-667-1815. Photo: Abrams Delight, ca. 1754, Parkview Street and Rouss Spring Road, Winchester VA. Built by Simon Taylor for Isaac Hollingsworth it is the oldest house in Winchester. Listed on the National Register of Historic Places in 1973. Photographed by User:Joel Bradshaw (own work), 2012, [cc0-by-1.0 (creativecommons.org/publicdomain/zero/1.0/deed.en], via Wikimedia Commons, accessed August, 2013. Winchester is the seat of Frederick County. Winchester is near the northern entrance to the Shenandoah Valley. It is the seat of Frederick County and the oldest Virginia city west of the Blue Ridge. In the 18th and early 19th centuries stagecoaches and wagons lumbered through its muddy streets, carrying adventurers westward and southward. Here crossed two old trails, which are today arterial highways serving the uses of commerce and vacationists. In spring, when the rolling countryside is beautiful and fragrant, Winchester's Apple blossom Festival attracts thousands of people, who come to behold the beauty of the 700,000 apple trees that bloom each year in Frederick County. Then the little city abandons itself to two days of festivity. Queen Shenandoah is crowned on the steps of Handley School. Surrounded by ladies-in-waiting, Her Majesty views a pageant enacted by 1,000 children. In the late afternoon there is an aerial show at Admiral Byrd Airport, southeast of town. The first evening is crowded with a reception for the queen and her court; a parade of Virginia fire companies, cadet corps from military schools, and World War veterans, marching to the music of many bands; street dances in roped-off areas; and a ball at the apple palace. On the second day school children re-enact their pageant; the queen is entertained; a parade with elaborate floats again enlists bands and soldiers; and at a late hour the queen's ball begins, bringing the festival to a close. Town Run and the tracks of the Baltimore & Ohio Railroad traverse Winchester. The comparatively level older portion of the city rises toward flat-topped hills: on the north Fort Hill, on the east church hill, on the south potato hill, on the west academy hill, Powell's Ridge, and Apple Pie Ridge an undulating checkerboard of apple orchards. Though many first settlers in Winchester were English, its neat compactness is attributable to Germans from the northern colonies. Houses built flush with the street, have tiny gardens tucked behind them and stoops that steal space from sidewalks. On the outskirts of the city, however, newer homes have indulged themselves in the luxury of surrounding lawns. 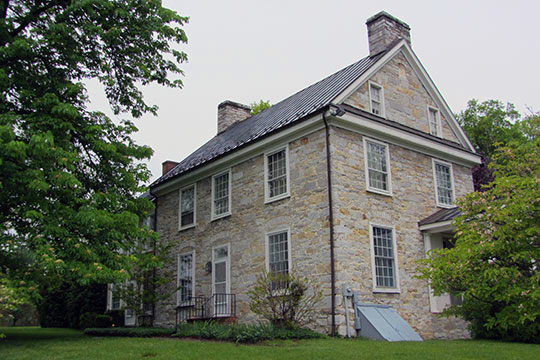 In 1732 Joist Hite crossed the Potomac at Pack Horse Ford near Present Shepherdstown, West Virginia, bringing 16 families from Pennsylvania at Opequon, five miles south of Winchester. From Isaac and John Van Meter, Hite purchased lands that were part of the Northern Neck proprietary of Thomas, Lord Fairfax. Though Frederick County was sliced in 1738 from Orange County, the story of Winchester, first Fredericktown, did not begin until 1744, when James Wood laid out a courthouse square and 26 lots. Frederick County held its first court in a log house Wood built at the present Glen Burnie. If Lord Fairfax had his way, Stephens City would have been made the county seat. James Wood, however, outwitted him by serving one of the justices enough toddy, and the deciding vote was cast for Frederick. In 1752, the town was laid out and named for Winchester, England. After General Braddocks defeat in 1755, Lieutenant Colonel Washington, placed in command of frontier forces, 'rid post to this place ... and found everything in the greatest hurry and Confusion, by the back Inhabitants flocking in, and those of the town removing out...No Orders are obey'd, but what a party of soldiers or my own drawn sword, enforces.' He set about to quiet a frightened people and to build Ft. Loudoun for their protection. Men of Winchester played a conspicuous part in the Revolutionary War. Their leader was Daniel Morgan who moved there from New Jersey in 1753. After the battle of Bunker Hill he organized a company of Northern Virginia riflemen. Commissioned captain of militia under General Benedict Arnold, he pressed with his company into Canada, was held prisoner in Quebec, fought in both battles of Saratoga, and as hero of battle of Cowpens was given credit for the defeat of General Tarleton. Morgan spent the last 10 years of his life in Winchester. Between the Revolution and the 1860s, Winchester grew and prospered. In 1779, the General Assembly authorized its incorporation as a town. Early in the 19th Century stage lines operated between Winchester and Harper's Ferry, continuing even after the Winchester and Potomac Railroad was completed in 1836. From the beginning until the end of the War between the states, Winchester was a center of military activities. Crops and cattle, mills and factories, made the valley an important requisitioning area for the Confederacy, and Winchester was a vantage point coveted by both armies. General Thomas J. Jackson was given command of the department of Shenandoah in October of 1861, he cleared Winchester of invading federal troops; in March 1862 Union forces under General Banks forced him to evacuate the town; but on May 25 he moved in again. Until the summer of 1864 Winchester changed hands many times and more than 100 military engagements took place in the surrounding area. Fighting at an end, Frederick County looked again to fields and orchards, and its principal town to marketing. Winchester was chartered as a city in 1874 and adopted the city manager form of government in 1918. It owes its recent prosperity to nearby orchards. Though the Virginia apple was not important commercially until after the War between the states, its fame had spread long before. After the establishment of the Virginia Agricultural and Mechanical College — now the Virginia Polytechnic Institute — serious attention was given to apple culture. The Institute's department of horticulture was founded in 1888.